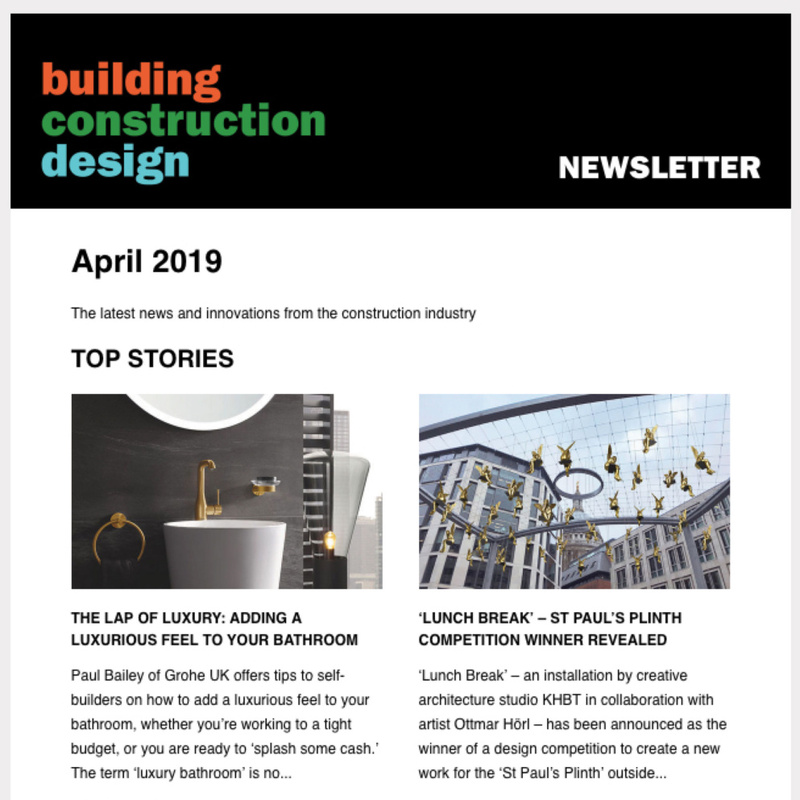 UK manufacturer Samuel Heath’s Bauhaus influenced Landmark collection of bathroom taps, showers and accessories has enabled home owners, architects and designers to achieve a totally co-ordinated finish for the industrial interiors theme. Free-standing baths are increasingly popular in both residential and hospitality settings and the Landmark collection is now further enhanced by the addition of a flawless, floor mounted single lever bath/shower mixer that will provide a stunning centrepiece to the finest luxury bathrooms. The stripped-down modernism on the outside conceals some of the most complex engineering ever undertaken by Samuel Heath. Beneath the sleek lines and gleaming exterior of the Landmark floor mounted bath/shower mixer lie the results of over two years of extensive design and development. 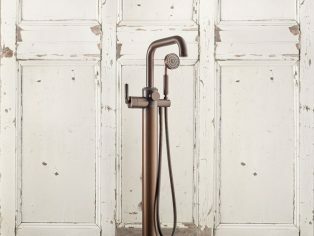 Eighty-six separate components go into manufacturing the Landmark floor mounted single lever bath/shower mixer making it one of the most involved pieces of engineering ever undertaken by Samuel Heath. One component alone, the water manifold, undergoes no less than one hundred and thirty different machining operations to manufacture what is a technically complex and highly challenging component. The new Landmark floor mounted bath/shower mixer’s installation kit is also a piece of extraordinary engineering that facilitates simple, secure and level fixing. Once the installation kit and finished floor have been installed the mixer can be assembled and rotated to any desired angle. The flow through the mixer from the installation kit cannot be impeded by overturning and the body of the mixer is designed with integral shock absorbing components to ensure uneven load can be withstood, for example if the user were to lean on the mixer. 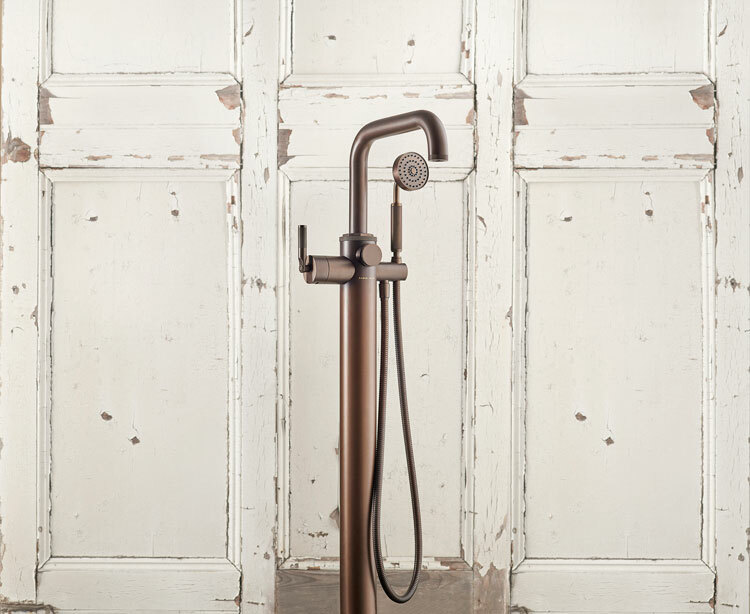 In keeping with the modern vogue for metallic the new Landmark floor mounted bath/shower mixer is available in a range of matt and high-gloss finishes, including Urban brass and Stainless steel with matt black chrome, plus City bronze, Chrome plate, Polished nickel or all in Matt black chrome as a special order. Samuel Heath has a showroom at Design Centre Chelsea Harbour, where the Landmark collection can be viewed together with Samuel Heath’s other bathroom collections plus its door and window fittings.